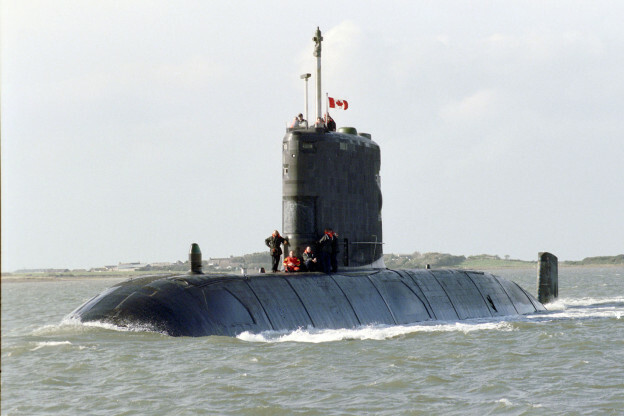 Home » Foreign Forces » Opinion: A Future for Canadian Submarines? Canada’s Victoria-class submarine fleet has been controversial since its inception. Most recently, a report by Michael Byers and Stewart Webb argues that the time has come to either phase out the program or commit to a robust discussion of how to replace the fleet. Critics cite a disappointing history of expensive repairs, time lost, and a catastrophic fire. Supporters insist that the boats provide important capabilities. And navy planners have sought to get the ball rolling on acquiring new subs sometime after 2020. Debate over the current fleet and its potential replacement should include all of those elements, but focus on how they align with one another, on whether submarines provide the right capabilities at the right price to serve Canada’s national interests. The subs were launched in the late 1980s and early 1990s, laid aside by the United Kingdom in 1994, purchased by Canada in 1998, and delivered between 2000 and 2004. Their first real refit was undertaken after years sitting in saltwater, ending in significant cost overruns. Tragically, during its cross-Atlantic voyage a fire broke out on HMCS Chicoutimi, resulting in the death of a sailor and deferral of Chicoutimi’s repairs to 2010. Since 2003, the boats have spent a combined total of 1,131 days at sea (less than 33 percent of the time). HMCS Corner Brook remains in maintenance that was begun after she ran aground during exercises in 2011 (to be completed in 2016) and despite a recent $209-million refit, HMCS Windsor is restricted to operations in Canadian waters until one of its engines is removed and replaced late this summer. Nevertheless, the fleet is scheduled to reach “steady state,” (two subs at high readiness, one at standard readiness, and one in refit) with the completion of Chicoutimi’s repairs at the end of 2013. As one retired admiral says, the fleet may be turning a corner and Canada may be able now to reap some benefits. With regard to replacing the fleet, Byers and Webb note the three main options, ranging in cost (depending on capabilities) from $365 million to $950 million per ship. They also note, though, that replacement subs would be new, off-the-shelf (but built in Canada) and unlikely to have similar maintenance problems and costs. Canadian interests to which submarines could be relevant can be divided into three categories: the defence of Canada and North America, supporting Canadian expeditionary deployments, and supporting Canada’s interests in global maritime stability. First, regarding the defense of Canada and North America, proponents argue that submarines provide the ability to covertly carry out coastal sovereignty and surveillance patrols, including in the Arctic. But as Byers and Webb point out, in Canadian waters at least, these functions can be performed better (and cheaper) by aircraft and drones, combined with surface-craft for enforcement. Also, the Victoria-class has no under-ice capability, although new subs likely would. Second, submarines could support certain expeditionary deployments. The current fleet can provide security for other naval platforms, their covert surveillance and intelligence gathering capabilities would be valuable, and they can enhance the activities of special operations forces. New subs could have the capability to hit land targets with guided missiles launched from offshore, as American and British boats did in support of NATO’s Libyan operation in 2011. Supporting global maritime stability is a key interest for Canada as it relies heavily on sea-borne trade, even with the United States. More broadly, Canada has long worked to entrench and expand global trade, which is heavily sea-reliant. As its government seeks to expand trade relations with Europe, Asia, and Latin America the importance of commercial sea routes—and therefore of global maritime stability—will only increase for Canada. This is especially the case in the quintessentially maritime Asia-Pacific region where China in particular is driving growth in economic and military power. Byers and Stewart argue that because of its global trading links, including those with Canada, China is unlikely to engage in conflict, so investing in submarines based on the slim probability of Canadian engagement in such a conflict may be unwise. But according to Elinor Sloan, the document that is presumed to be guiding future platform acquisitions—“Horizon 2050: A strategic concept for Canada’s navy”—views maritime inter-state competition in the region with concern. Territorial disputes, great-power strategy, and nationalist emotions in the Asia-Pacific region create a volatile mix. In this environment conventional deterrence and power projection will play an important role, either in maintaining stability or in actual conflict. The potential for a Canadian submarine presence in such Asia-Pacific roles was forecast by HMCS Victoria’s participation in the U.S.-led Rim of the Pacific 2012 exercise. Submarines provide access to areas denied to other forces and serve as a credible deterrent against almost all forces, including other states’ sea-borne power-projection platforms. They can also serve in a power-projection role, especially around shipping “choke points” and littoral areas. To be sure, surface ships can perform these roles (and others that submarines cannot), but they lack the tactical and psychological advantages of stealthy subs. Debate concerning Canada’s submarine fleet and its possible renewal will consider many factors, from costs to capabilities and interests. The final decision must be made based on how those factors align with each other. Submarines provide many capabilities, but they are not necessarily the only platforms that do, and may or may not be the most efficient platforms in the doing. A version of this story originally ran as a piece with The Atlantic Council of Canada.